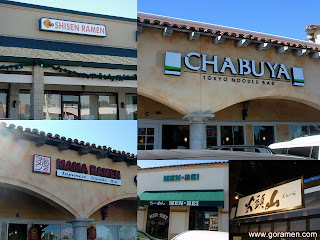 A couple ramen-ya's that were overlooked in my recent Ramen Madness in Torrance post just happen to be located right next to each other off of PCH in the Rolling Hills Plaza. One being Koraku, which I visited today, also has locations in Downtown and Sherman Oaks (and possibly a relative near Vegas). The other, as you can see in the picture above, was closed on this day before Thanksgiving. 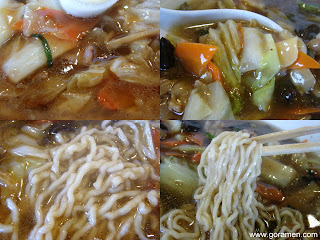 Mabo Ramen: After a night of rain and a crisp, cool morning, the mood was perfect for ramen. So of course I set out to the mecca to enjoy a nice, traditional Japanese-style Mabo. I often frequent and enjoy a bowl of Mabo at the Sherman Oaks location because it's near one of my clients so I figured the Torrance Koraku would be just as good, if not better. And guess what? It was better! The dense mabo sauce layered atop a shoyu-based ramen immediately fulfulled my craving and handcuffed my chilly soul. Mmmm...ground pork and tofu, what would I do without you?! The average factory-based noodle coated with Mabo sauce inherently becomes above-average with every slurp. Whoever decided to combine Mabo Tofu with Ramen is a genius and truly one of my idols...hahaha. Anyway, so back to that crazy person. Her exact words went something like this: "Everybody listen up! You have the right to remain silent! I work for the U.S. Government and I have been observing all of you and I am hereby putting you all under citizen's arrest!" She then went on to ramble for about 2 minutes, saying how none of us had any empathy and that we should all be ashamed of ourselves. And then she left. I honestly didn't know what she was talking about. And when she first stood up Pulp-Fiction-style, I didn't know whether to be scared or just bust out laughing. My initial thoughts were "s*** were all getting robbed" and I even thought about tackling her as she walked by. There were several families with small children also in the restaurant and you could see the relief on their faces when she walked out the door. It was very, very strange. My only explanation for her rant was possibly because she is some kind of animal rights activist and couldn't find anything on the menu that didn't contain chicken or pork. Nonetheless, I'm glad noone was hurt and that it was just a form of self-expression rather than an act of random violence. 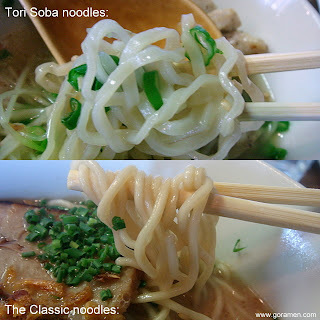 Last year around this time, I was only 42 posts in to my ramen blogging adventure. And now, thanks mostly to a Foo-Foo October, I give you post #200. 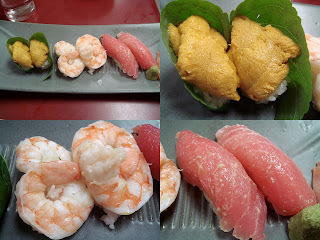 You might be asking yourself why I chose to visit Hanaichimonme (again) for my 200th post. Well it's very simple. 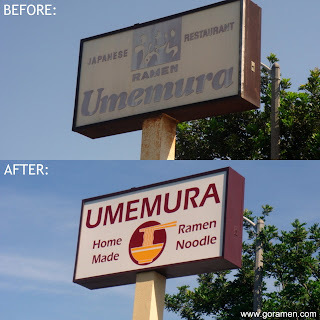 Hanaichimonme has been around forever (at least as long as I can remember) and although they might not serve the best ramen in LA, depending on who you ask, they've indeed left a special mark on my childhood. And with the recent sale of the Little Tokyo Shopping Center, I feel that it's more important than ever that WE try to keep the new plaza owners from eliminating those special memories...RIGHT?!! 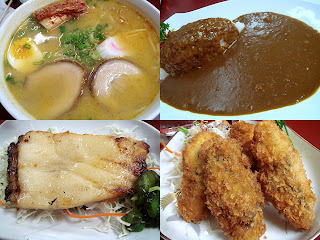 Hanaichi Ramen: The best ramen in the Little Tokyo Plaza! Okay, so there's not much competition if I put it like that, but it's still a decent bowl in a nostalgic setting that could easily grow on you after a few trips. It's a simple old school shoyu noodle that makes you feel like a kid again--at least that's what it does for me. So before you begin to hate on something that (in your opinion) doesn't measure up to that other place on 1st street, let's just take a step back and remember the simple times in life. Hakata Ramen: It's not the rich, creamy tonkotsu that you might be used to, but it's a lot lighter and seemingly healthier than the best. The toppings (moyashi, shoga, menma, wakame, negi, sesame seeds) are very average, but it wouldn't be the same without them. The most popular dish on their menu, Spicy Chanpon, also uses this soup as its base. Manufactured or not, the noodles at Hanaichimonme are worth remembering. I like them a lot and their thin, chewy spaghetti-like texture do nothing but improve anything they touch. It's been about a week between posts (an interesting week at most) and I'd like to just give a quick thanks to everyone who inquired about my situation with the fires from last weekend. They did come fairly close to my home, but luckily mother nature and the courageous firefighters kept them from spreading. For those that weren't as fortunate, my thoughts are with you and I hope you are all able to overcome this great tragedy. I woke up this morning with a mild hangover and the irritable feeling of not trying the Yasai Ramen on Day 12. If you recall, that was the day I was lucky enough to try the prototype Chawanmushi Ramen. But it still bugged me and I was determined to eat every ramen on the wall. So, of course, I headed back to Foo-Foo Tei for the 33rd consecutive day in order to ease my mind from that irritable feeling and that mild hangover. The Yasai Ramen is exactly that--lots of vegetables in your choice of soup (shoyu, shio, or miso). I chose the shoyu today because I was utterly craving it and today's weather was perfect for it. I feel much better. I can now officially say that I've eaten all 31 bowls of ramen on the wall plus 2 prototypes. Yay!